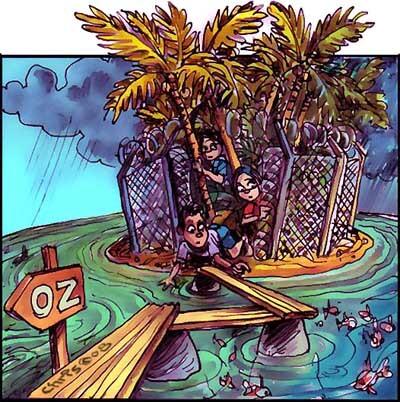 This cartoon by Chris Johnston in Eureka Street, titled 'Towards true immigration reform', shows the twisted ways of Australian refugee protection. On July 29, 2008, Immigration Minister Senator Chris Evans outlined major changes to mandatory detention policies in a lecture at Australian National University. However, apart from mentioning 'regulation changes', he merely alluded to legislative reforms 'next year'. This month, on June 25, 2009, the Minister came good on his commitment. He tabled legislation in the Senate to be implemented during the August session of Parliament. "This Bill makes provision for suitably risk-assessed persons in immigration detention to be given some effective control and personal responsibility for their own circumstances"
"...for persons in immigration detention to attend an educational facility to undertake a course, to visit a doctor unescorted, or attend a wedding or funeral of a close friend or relative..."
"...if a minor is to be detained as a measure of last resort, the minor must not be detained in a detention centre established under this Act..."
Christmas Island is not a place to lock up people who have committed no crime. Christmas Island should not be Australia's preferred 'prison island', because for now, even if all announced and legislative changes have been implemented, it remains that: Australia's Gulag Island. Transforming Australia's prison island into Australia's Gilligan's island does not take away its isolation intent, and the Rudd government needs to go much further to take all politics out of the processing of asylum seekers. 1 August 2008: Petro Georgiou endorses Labor's detention softening - Project SafeCom's first reaction to Labor's announcement of major detention changes mentioned the notion of "smoke and mirrors", and now that the dust of initial reaction has settled, more in-depth reflections on the changes are what's needed. This page brings together some of these opinions, starting with Petro Georgiou, and then pieces by The Australian's Mike Steketee and Denis Shanahan. 17 May 2008 - Australia ends its Temporary Refugee Protection Visa Cruelties - When last week Labor's first Federal Budget came down, it brought with it provisions to end the Temporary Refugee Protection Visa, cruelly introduced by John Howard to stave off political challenges posed by right-wing nationalist-populist politician Pauline Hanson. Here is Australia's initial reaction. The Migration Amendment (Immigration Detention Reform) Bill 2009 amends the Migration Act 1958 (the 'Act') to give legislative effect to the Government's New Directions in Detention policy. Australia under the Rudd Government has one of the toughest and most sophisticated border security regimes in the world, with a system of extensive air and sea patrols, excision, offshore processing, mandatory detention of unauthorised boat arrivals and unlawful non-citizens who pose a risk to the Australian community. The Rudd Government has reinvigorated Australia's engagement with regional neighbours to detect and prevent the insidious trade of people smuggling and committed $654 million to substantially increase aerial and maritime surveillance and detection operations in the region. The reforms outlined in this Bill will complement Australia's strong border security measures to ensure we have an immigration detention system that protects the Australian community and treats people humanely. The Rudd Labor Government was elected on a platform that included a commitment to implementing more humane detention policies. On 29 July 2008, the Government announced seven Key Immigration Detention Values to give effect to that commitment and to guide and drive new detention policy and practice into the future. The Government's Key Immigration Detention Values provide the framework for our approach to immigration detention, maintaining a commitment to effective border management while treating unlawful non-citizens compassionately. The Government introduced these values to address serious concerns about Australia's immigration detention system. Under the previous Government detention was the default position. Children were locked behind barbed wire and desperate and vulnerable people who had fled war and persecution were left to languish in detention centres for years on end with no resolution in sight. Research has shown that detention, particularly long term detention, may have severe impacts on both the physical and mental health of detainees. This Government's approach to managing the immigration population is one based on a risk management matrix. The level of restriction on a person's liberty and the degree of monitoring relates directly to a client's assessed risk to the Australian community, including any risk of non-compliance with Australia's immigration laws. While detention is a key component of immigration compliance, it is only one tool in a suite of management options. In this legislation, the Department of Immigration and Citizenship (the 'Department') will assess risk in managing compliance with Australia's migration system. The detention values embrace a risk-based approach to immigration detention which focuses on the prompt resolution of status, rather than on automatic, inflexible and often counter-productive detention. The Government's policy will reduce the duration of detention, with greater transparency, oversight and accountability around both the decision to detain and the decision to continue detention. This approach seeks to flexibly manage risk and reduce the cost and impact of detention. Not just the very expensive cost to taxpayers in managing a detention program, but also its detrimental impacts: the impact on the wellbeing of individuals placed in the Department's care, most particularly in relation to their mental health, the effect on the Department and its staff and the damage done to Australia's international reputation as a result of the previous detention regime. In many respects the new detention values, and the amendments proposed in this Bill, represent a continuation of the reforms introduced by the former Government in 2005. After years of a harsh detention regime that included the locking up of children, and in the wake of the Cornelia Rau and Vivian Alvarez Solon scandals, the former Government came to the realisation that the continuation of their existing policies was untenable. The 2005 changes represented important steps in liberalising what had become a harsh and inefficient system of immigration detention. This legislation builds on those reforms in moving towards a modern risk management model for immigration detention. Within this framework, detention in an immigration detention centre involves a high level of restriction and monitoring, appropriate to managing high-risk individuals. Detention in the community under a Residence Determination, by contrast, involves management not through a restriction of liberty, but through the imposition of conditions such as requirements about where a person is to live, reporting mechanisms and a restriction on activities. Those posing low risk to the Australian community will be placed in the community. The most vulnerable of these community clients will be supported to an immigration outcome. The Australian Red Cross provides community care for these people and their health needs are supported by the International Health and Medical Service. Within this system, clients are assessed for risk and placed appropriately within the compliance framework. Three groups will be subject to mandatory detention: first, all unauthorised arrivals will be detained for the management of health, identity and security risks to the community; secondly, unlawful non-citizens who present unacceptable risks to the community; and thirdly, unlawful non-citizens who have repeatedly refused to comply with their visa conditions. This approach will see high-risk clients detained in secure detention facilities. Unauthorised arrivals and others assessed as posing an unacceptable risk to the community, including those who have demonstrated repeated non-compliance with immigration laws, will also be located within the detention network. This may involve placement in an immigration detention centre for those at the higher end of risk, and in lower security facilities such as immigration residential housing or immigration transit accommodation, or in community detention, for those presenting a lower level of risk. Other clients - generally those seeking an immigration outcome after applying for a Protection visa, visa overstayers, and those who have had their visas cancelled for non-compliance of a minor nature - will generally be managed in the community. This approach to immigration compliance mitigates the adverse impacts of detention and also places protection of the community at the forefront of our considerations. Most importantly, this risk-based approach relegates the use of detention to being one management tool in a suite of measures available to the Department to manage compliance. Following the announcement of the Government's New Directions in Detention policy last July the Department began implementing the reforms administratively, while developing the required legislative and regulatory changes. Under the Rudd Government, children are not, under any circumstances, to be held in immigration detention centres. In 2005 the former Government brought in legislative changes that embedded in the Act the principle that minors would only be detained as a measure of last resort. The Rudd Government's detention values extend on this principle, requiring that minors shall only be detained as a measure of last resort and will never be detained in an immigration detention centre. This policy was immediately implemented administratively in July 2008 in Departmental policy and operations. While there still may be occasions when minors will be accommodated in low to medium security facilities within the immigration detention framework, such as immigration residential housing and immigration transit accommodation, the priority is that minors and, where possible, their families will be promptly accommodated in community detention while necessary checks are undertaken. This arrangement allows minors and their families to move about in the community under the care of the Commonwealth and to receive support from non-government organisations and State and Territory welfare agencies, as necessary. The policy priority continues to be the resolution of a minor's status at the earliest possible time. The Government considers that this measured approach strikes the correct balance between operating a migration program with integrity whilst also ensuring that the welfare of children is a primary consideration. The primary objective is resolution of status, thereby reducing the duration of detention. Recognising the severe impacts of long-term detention, the Coalition in 2005 introduced two year Ombudsman's reviews of detention. Unfortunately, despite introducing this mechanism, the former Government never responded seriously to the Ombudsman's recommendations. Too often, people remained in long term detention because there was no political will to resolve their difficult cases. As the Rudd Government's detention values state, indefinite detention is not acceptable. Under this Government the Department has taken a proactive approach to the prompt resolution of detention cases, whether that be through progressing a client on a visa pathway or-when a client has no right to remain in Australia - expeditiously removing them. There is also a greater focus on, and response to, the Commonwealth Ombudsman's two year reports and recommendations. This approach has significantly reduced the incidence of long-term detention. As at 22 June 2009 only 26 clients had been in detention for longer than two years. This is in marked contrast to the 74 clients who had been in detention for two years or more when the Rudd Government came to office. Both the length and conditions of detention are subject to regular review. While the Department regularly evaluates each person in detention to ensure that they are being detained in the most appropriate environment, commensurate with the risk they present, new review mechanisms announced in July 2008 have increased transparency and accountability of these processes. The three-monthly Senior Officer reviews, undertaken by experienced Senior Executive Service Officers in the Department, will focus on the lawfulness and appropriateness of continued detention. The Senior Officer reviews consider the progress towards case resolution and, if ongoing detention is still justified, the appropriateness of placement and support arrangements within detention. The new half-yearly Commonwealth Ombudsman review operates in addition to the existing two year review process. Amongst other things, the half-yearly reviews examine the specific issue of why the person is in detention, consider the steps being taken to resolve the person's detention and assess the suitability of the person's current detention arrangements. These reviews provide a fresh perspective on each case, increasing the impetus for resolving any barriers to case resolution. The presumption has shifted to a person remaining in the community while their immigration status is resolved. Significant progress has been made to ensure that detention is used only where it is warranted. Decision-makers focus on assessing clients for an unacceptable risk to the community, including any repeated non-compliance with visa conditions. The Department has significantly reduced the use of detention by using flexibilities currently available in migration legislation, and in particular in Bridging E visa provisions. Since the introduction of the new detention values, it is particularly significant that these changes have not adversely affected compliance levels. The Department has been able to resolve more cases in the community without those people breaking contact with the Department and absconding. Since July 2008, 50 per cent of unlawful non-citizens located by compliance officers or through police referral have been detained, compared to 65 per cent in the previous financial year. Those not detained have been managed in the community on a Bridging E visa. Despite more people being managed in the community, rather than held in a detention centre, the rate of compliance, including departure from Australia, has remained steady at around 90%. There has been no increase in the number of unlawful noncitizens and the overstayer, or non-return rate, has remained steady at less than half of one percent, despite arrival numbers having increased. The administrative and policy changes reflected in this legislation are supported by other Government funding and policy initiatives. The 2009-10 Budget included important measures to support people having their immigration status resolved while in the community. Firstly, some $77.4 million has been allocated for the implementation of integrated initiatives to actively, efficiently and effectively manage clients in the community to an immigration outcome through early intervention. These measures build on and continue the work of the successful Community Care Pilot and the Community Status Resolution Trial, both of which were introduced by the former Government, in May 2006 and July 2007 respectively. Notably, the cost of providing these services was offset through savings on existing immigration detention outlays. The Government also announced in the 2009-10 budget $186.3 million over five years for the extensive redevelopment of the Villawood Immigration Detention Centre, fulfilling this Government's commitment to update immigration detention accommodation. To further the Government's strong commitment to the active and speedy resolution of immigration status for unlawful non-citizens - including a commitment to the removal of people who have no right to remain in Australia-Item 1 of Schedule 1 to the Bill provides for a statement of principle, through the insertion of section 4AAA in Part 1 of the Act, clarifying the purpose of immigration detention. That purpose is to manage unacceptable risk to the community of a non-citizen entering or remaining in Australia, and to resolve the non-citizen's immigration status, either through the grant of a visa or their prompt removal or deportation from Australia. The Labor Party went to the last election with a commitment to maintain a system of mandatory detention and that commitment was honoured in the Government's Key Immigration Detention Values. The Government remains committed to the retention of mandatory detention as sound and responsible public policy to manage health, identity and security risks to the community. the person's visa had been cancelled under section 109 as the person gave information that was false when in immigration clearance. if the person held an enforcement visa and remains in Australia when the visa ceases to be in effect; or if circumstances prescribed by the Migration Regulations 1994 apply in relation to the person. resolve the person's immigration status - either through the grant of a visa or the person being removed or deported. For any other person known or reasonably suspected of being an unlawful non-citizen, detention is discretionary. To achieve this, subsection 189(1) in Division 7 of Part 2 of the Act will be repealed and substituted with a new subsection 189(1), together with the insertion of new subsections 189(1A), (1B) and (1C). Existing subsections 189(2)-189(5)-including detention arrangements for offshore entry persons-remain unchanged. Unlawful non-citizens, including offshore entry persons, in excised offshore places will continue to be subject to the existing detention and visa arrangements of the excision policy. Offshore entry persons are unable to apply for any visa in Australia while they remain an unlawful non-citizen unless the Minister acts personally to allow them to make a valid visa application. These amendments will support the first two of the Government's Key Immigration Detention Values that reiterate the essential role of mandatory detention in maintaining strong border control and the management of high risk groups. This Bill contains four key measures to broaden the application of the new Immigration Detention Values under the Act. First, in accordance with the Government's Key Immigration Detention Values, and reflecting Australia's international human rights obligations, detention that is indefinite or otherwise arbitrary is not acceptable. Item 1 of Schedule 1 to the Bill will embed this value in the Act, by introducing a statement of principle in Part 1 of the Act that, first, a noncitizen must only be detained in an immigration detention centre as a measure of last resort and secondly, that if a noncitizen is detained in an immigration detention centre, then detention will be for the shortest practicable time. The introduction of this principle builds upon existing operational processes including the new three monthly Senior Officer reviews and new six-monthly Commonwealth Ombudsman reviews of clients in detention. Together, these measures will help to facilitate the timely resolution of a client's immigration status and ensure detention is used for the shortest practicable time. Secondly, Item 3 of Schedule 1 to the Bill incorporates two measures relating to the management of minors in the immigration detention environment. While the Act was amended in 2005 to affirm the principle that children should only be detained as a last resort, the principle does not limit the location and nature of any such detention. The Government's detention values build on the 2005 principle by explicitly banning the detention of children or those reasonably suspected of being a child in immigration detention centres. This Bill embeds that strengthened position in the Act. Firstly, section 4AA in Part 1 of the Act is extended to provide that if a minor is to be detained as a measure of last resort, the minor must not be detained in a detention centre established under this Act. Secondly, while prompt placement of children and, where possible, their families in community detention remains the Department's priority, there will be occasions when children will be housed in low to medium security accommodation within the immigration detention framework, such as immigration residential housing and immigration transit accommodation. This policy reflects the Government's commitment to keeping families together and is necessary as children and / or family members undergo health, identity and security checks. An explanatory note inserted in the Act will clarify that immigration transit accommodation and immigration residential housing are among places approved by the Minister as alternative places of detention, and as such, are distinct from detention centres created under the Act. Section 4AA is extended to specify that the best interests of the minor are a primary consideration in any decision of an officer about where to detain a minor under section 189 of the Act. The Department has, over recent months, been undertaking a review of all policy and procedural matters relating to the treatment of minors as they enter, transit, and leave detention. This review is to ensure that the 'best interests of the child' principle is at the forefront if a minor is taken into immigration detention. As this review progresses I intend to issue a Ministerial Direction under section 499 of the Act in respect of children in detention to guide officers as to the principles that apply if a minor is detained. The broad objective behind the Ministerial Direction will be to ensure that if a minor is detained for a short period while their status is being resolved, their treatment, and the conditions of the detention environment, are humane and have as little adverse impact on the child as possible. The principles will be consistent with Australia's obligations under the Convention on the Rights of the Child 1989. Thirdly, this Bill introduces further reforms to increase flexibility in what constitutes 'immigration detention'. Currently, clients can leave detention facilities for excursions or to attend medical appointments only when accompanied and restrained by an officer, including a guard, or a Directed Person. This requires the detainee to be in the direct line of sight or physical presence of the relevant person. Item 12 of Schedule 1 to the Bill introduces the new Temporary Community Access Permission (TCAP). A TCAP will maintain the legal status of immigration detention for a client while enabling the removal of the physical presence requirements in specific circumstances. The grant of a TCAP by an authorised officer will depend on a robust risk assessment taking into account the individual circumstances of the case. for the purpose or purposes specified in the permission. This Bill makes provision for suitably risk-assessed persons in immigration detention to be given some effective control and personal responsibility for their own circumstances. For example, it is envisaged that TCAPs could be utilised for persons in immigration detention to attend an educational facility to undertake a course, to visit a doctor unescorted, or attend a wedding or funeral of a close friend or relative. For many, these opportunities provide a greater personal benefit than might be immediately apparent and provide the basis on which their social and physical well-being can be maintained. While immigration detention is administrative in nature, the TCAP concept is similar to the options already available in criminal justice systems to manage day release permissions and the like, where risk assessments are favourable. I stress that clients will be robustly assessed for risk prior to the grant of a TCAP: new subsection 194A(2) provides that an authorised officer may only grant a TCAP if it is considered it would involve minimal risk to the Australian community. Should a person infringe the conditions attached to their TCAP, then the permission will be subject to revocation. The TCAP will be managed by the Department and an authorised officer will make all decisions in relation to the granting, variation or revocation of the TCAP. These arrangements will provide greater flexibility to the Department by increasing the options available to it in responding to the needs of persons in detention. The introduction of the TCAP concept builds on the Residence Determination system introduced by the former Government. It will support this Government's Key Immigration Detention Value that 'Conditions of detention will ensure the inherent dignity of the human person'. Finally, Items 13 and 14 of Schedule 1 to the Bill extend the Residence Determination powers available to the Minister in Division 7 of Part 2 of the Act, making those same powers available to be exercised in the public interest by a senior departmental officer delegated by the Minister. Under the legislation introduced in 2005 the Minister has a non-compellable and non-delegable power under section 197AB (Residence Determination) to allow a person who is an unlawful non-citizen to remain in the community, if that is in the public interest. The Minister may allow individuals and/or families to reside in the community at a specified place in accordance with conditions that address their individual circumstances. The power delegated to the departmental officer will be noncompellable in the same way as the Minister's powers are non-compellable. It is expected that the amendments extending these provisions will greatly reduce the number of Residence Determinations referred to the Minister and provide the Department with greater flexibility to manage clients in detention. The conditions that will attach to the determinations will remain unchanged, such as to require the person to be present at a specified residence during specified hours, and to report to immigration officials at specified times. The current requirement to table a statement in Parliament when the Residence determination power is used will apply also to Residence Determinations made by departmental officers. In addition to the legislative amendments, the Department is currently developing significant accompanying regulatory reform to give effect to the New Directions in Detention policy. It is planned that the changes to the Act and the Migration Regulations 1994 will commence on the same day. The Rudd Government is committed to establishing a fairer, more humane and effective system of immigration detention, which restores dignity and fairness to clients and rebuilds integrity and public confidence in Australia's immigration system. Like the 2005 reforms introduced by the previous Government, these changes build additional flexibility into the options available to the Department to manage people in immigration detention. In pursuing these amendments the Government has considered the findings and recommendations of a number of reports, as well as the views expressed by key stakeholders at a series of consultations held across Australia in late 2008. The Joint Standing Committee on Migration report Immigration detention in Australia: A new beginning - Criteria for release from immigration detention, released in December 2008, has been influential in framing the Government's policy. The Committee unanimously recommended as a priority, that the Australian Government introduce amendments to the Act to enshrine in legislation the reforms to immigration detention policy, and that the Migration Regulations 1994 and guidelines be amended to reflect these reforms. This Bill is consistent with that recommendation. The Rudd Government's approach to immigration compliance places protection of the community at the forefront of the Department's considerations and mitigates the detrimental impacts of detention. This risk-based approach recognises the use of detention as one of a number of measures available to the Department to manage compliance. Importantly, this Bill will ensure that children are never again locked up in a detention centre. It will ensure that people are not held in detention indefinitely. It will ensure that people are treated humanely, fairly and reasonably. The Bill will ensure that people in immigration detention are treated as human beings with the dignity they deserve. It implements a risk-based approach to detention so that people are held for the shortest practicable time with the necessary oversight and accountability around decisions to detain. This Bill represents an important legislative step in the Government's reform of immigration detention. It deserves the support of all members of this Parliament. I intend, after debate on the Second Reading Speech of this Bill has been adjourned, to seek leave of the Senate to move a motion that this Bill be referred to the Legal and Constitution Committee for their consideration, with a reporting date of 11 August 2009. Ordered that the bills be listed on the Notice Paper.